Every child knows about origami. The skill of this oriental art lies in folding a flat sheet of paper into different – and in some cases highly complex – structures. Examples of origami also exist in the natural world. The wing of an earwig is a perfect illustration: its elaborate design is far more ingenious than any manmade structure. When open, the earwig wing expands ten times larger than when closed – one of the highest folding ratios in the animal kingdom. The large wing area allows the insect to fly, while the compact way the wings retracts enables the creature to tunnel underground without damaging its wings. The wing design has another unique feature; however, in its open, locked state the wing remains stiff with no need for muscle power to provide stability. With just one "click", the wing folds into itself completely, without muscular actuation. Researchers at ETH Zurich and Purdue University have been studying the secret of the earwig's origami-like wings and have created an artificial structure that functions on the same principle. Their paper has just appeared in the journal Science. To analyse the wing structure and function, the study's lead author, Jakob Faber from the research group led by André Studart, Professor for Complex Materials at ETH Zurich, in collaboration with Prof. Andres Arrieta of Purdue University performed a computer simulation of the wing's function. This showed that if the wing were to operate on the classical origami principle – using rigid, straight folds with an angular sum of 360 degrees at their intersections – the earwig would only be able to fold its wing down to a third of its size. The crucial factor in the design of the insect's wing is its elastic folds, which can operate either as an extensional or rotational spring. The wing joints are made from layers of a special elastic biopolymer, resilin, whose arrangement and thickness determines the spring type. In some instances, both extensional and rotational functions are combined in the same joint. Faber and his colleagues also examined the point in the earwig's wing that is responsible for stability in both the open and closed state: the central mid-wing joint. At this point, the folds intersect at angles that are incompatible with rigid origami theory. "This point locks the wing in place in both its open and closed state," Faber stresses. The researchers transferred the findings of the computer simulations to a multi-material 3D printer. This allowed them to directly manufacture a 4D object comprising four stiff plastic plates connected to each other by a soft elastic joint. The spring functions of the connecting folds were programmed into the material to enable them to perform extensional or rotational movements, mimicking the biological model. The insect's wing is stable when open, but folds together automatically on even the lightest touch. In the next step, the researchers transferred the principle to larger elements and printed a spring origami gripper. This structure self-folds, locks and is then able to grip objects without the need for external actuation. Faber's 3D printed, self-folding origami elements are currently only available as prototypes. 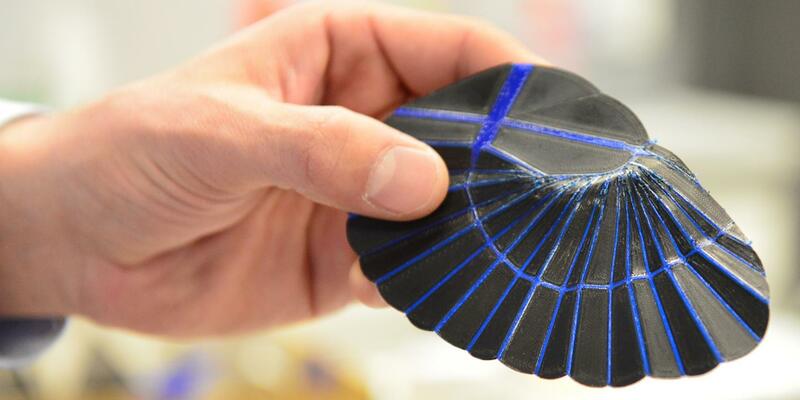 One potential application might be foldable electronics. Another area is space travel: solar sails for satellites or space probes that could be transported within a very small space and then unfurled to their full size at their place of use. Self-locking bioinspired origami structures like the earwig wing would save space, weight and energy, as they do not require any actuators or additional stabilisers. ETH researchers can also imagine more mundane uses, such as foldable tents, maps or package inserts. "Once you've unfolded these things, it's often impossible to fold them back to their original shape. If, on the other hand, they simply refolded automatically, this would save a lot of hassle," says Faber, with a playful look.